Poissy is a commune in the Yvelines department in the Île-de-France in north-central France. 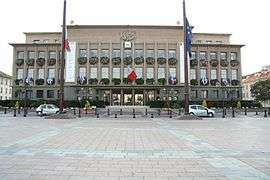 It is located in the western suburbs of Paris, 23.8 km (14.8 mi) from the centre of Paris. In 1561 it was the site of a fruitless Catholic-Huguenot conference, the Colloquy at Poissy. It is known for hosting successively the Automobiles Gregoire, Matford, Ford SAF, Simca, Chrysler, Talbot factories, and now hosts one of France's largest Peugeot factories. Inhabitants are called Pisciacais. The "Simca Poissy engine" was made here. Poissy is served by Poissy station on Paris RER line A and on the Transilien Paris – Saint-Lazare suburban rail line. Poissy is a rail station in Poissy, France, at the western edge of Paris. Although interconnected with the Paris Métro, it is actually located on the RER A line, one of the five lines of the Réseau Express Régional, or Regional Express Network. 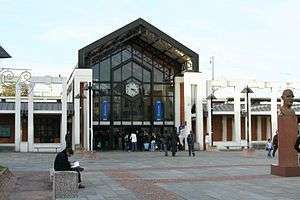 The station is also served by the SNCF (Société Nationale des Chemins de fer Français), France's national railway. It is situated on the Paris–Le Havre railway. There are ticket machines in the station for both RER and SNCF trains, as well as staffed RER ticket windows and a small shop.